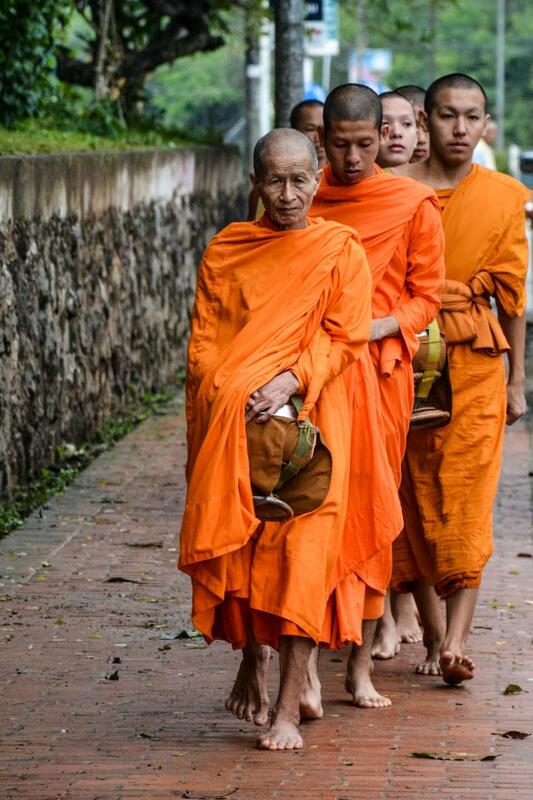 As the sun rises in Luang Prabang, Laos, hundreds of Buddhist monks depart their various temples and walk in a single file procession down city streets collecting alms. This daily ritual, dating back to the 14th century, plays out today largely in the same way it has for 800 years — as a silent and spiritual river of orange moving through the still, heavy air of an early morning along the Mekong River. Almsgiving is a centuries-old practice meant to teach humility to the monks and compassion to those distributing alms. Residents and tourists alike flock to the sidewalks slightly before dawn to set up their stools and blankets. In their hands they carry woven baskets containing alms, usually sticky rice. The devout Buddhist residents wait silently; chatter usually arises from clumps of tourists. Someone motions down the street. A wave of orange is on its way. Once it hits, it doesn’t subside until the temple’s flock has received their share of alms. Then a congregation of monks from a neighboring temple streams in front of you, heads bent, arms outstretched, completely silent. Then another. And another. Thirty minutes later, your store of sticky rice depleted, you look around slightly exhausted. The wave of orange is gone, and you’re left sitting on a quiet boulevard with relics of French Indochina surrounding you — crumbling colonial buildings, mansions and Francophile cafés with their shutters still drawn — feeling as though you have just participated in a timeless act that maybe, just maybe, might have cleansed your weary soul. Luang Prabang is the spiritual center of Laos, so even after the almsgiving procession has concluded the monk-to-non-monk ratio feels as if it’s ten to one. I would wander the streets and catch flashes of orange darting around corners, slipping into temples, and buzzing past me on bicycles. The seemingly ubiquitous presence of these monks in this small peninsular city in the middle of the Laotian jungle, sandwiched between the Mekong and Nam Khan Rivers, was beguiling. I had been traveling the previous couple of weeks, solo through Cambodia and with friends in Bangkok and Chiang Mai, Thailand. Flying over the muddy Mekong and dipping between verdant mountainsides to land at Luang Prabang’s tiny airport, I immediately recognized this place was a departure from my prior travels in Southeast Asia. To begin, it wasn’t crowded. For two of the three nights we stayed in Luang Prabang, my traveling companions and I were the only guests at our hotel, the Belmond La Résidence Phou Vao. Dirt roads were the norm rather than the exception once you left the city center. One day, my friend and I rode bicycles from the hotel 30 kilometers down a random road where we pedaled under canopies of trees indescribably green and thick while clouds lackadaisically drifted through the mountain valley surrounding us. On our return we stopped by Ock Pop Tok, a traditional Laotian handicraft store overlooking the Mekong. Bicycles now laden down with scarves and cushion covers, we pedaled back into town where we stopped to explore one of Luang Prabang’s thirty Buddhist temples — the bicycles were left unlocked by the temple gates because Luang Prabang is that sort of town. But it’s the memory of two almsgiving mornings that linger with me now, months after I’ve returned from Luang Prabang. Blame it on the orange robes — a color so striking and vibrant in a typically placid environment that it brings attention wherever it goes. Blame it on the tradition — I knelt with my feet tucked behind me and my head bowed in silence, the heavy weight of religion and propriety and austerity (and humidity) seeping into every secular pore in my skin. Blame it on the fact that I was sitting on a sidewalk in the middle of Laos handing out sticky rice to monks young and old while the burnt orange waters of the Mekong lapped against the shore a few hundred yards away and water buffaloes bayed and tuk-tuks sat idly along the curb — I was in Luang Prabang, lost in a timelessly transcendent experience for those first few minutes after sunrise when the world is caught rubbing its bleary eyes unsure if it’s awake or asleep or stuck somewhere in between.